Thinking of Getting Dentures in Solihull? Dentures are artificial teeth made of acrylic or metal. They’re designed to help patients who have few or no remaining teeth. When fitted well they’ll fit comfortably over the gums and provide the wearer with a set of teeth for chewing and for cosmetic reasons which replace the ‘real thing’. 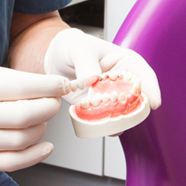 We fit dentures for patients of all ages. Speak to your dentist if you want to find out if they are the right option for you. Otherwise known as full dentures these replace all of your natural teeth, in both the upper and lower jaws, giving you an entirely new set of teeth. This option is suitable for patients who need to have all remaining teeth removed. These fill the gaps where individual teeth have been lost. They can be attached to the other teeth in your mouth with specially designed metal clasps or a dental device called precision attachments. These are the ideal option for patients who have smaller spaces in their natural teeth to fill. Firstly your dentist will take detailed measurements and an impression of your mouth. He or she will then give this to a clinical dental technician who will create your own custom made dentures. Usually as soon as your teeth are removed the dentures will be fitted, although in a few cases some time will be needed for the gums to heal before they are ready to accommodate dentures. It can be an unusual feeling wearing dentures at first, but this is something that you will quickly become used to. You may be advised to wear your dentures at all times of day and night to begin with and then you may choose to remove them for sleeping. This time can give the gums time to rest too and is often a popular option with patients. If you do remove your dentures it’s essential that they’re kept moist to prevent them from misshaping. Many people opt to keep them in a glass of water, or in another suitable container. Are you thinking of getting dentures in the Solihull area? If you would like to know more please get in touch. Our team will be only too happy to book you an appointment to meet with one of our dentists, so that you can discover the best option for you.